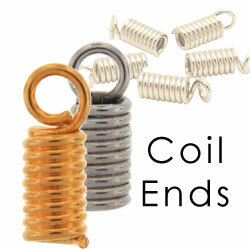 Cord ends are also known as Thong Ends, Coil Ends, End-Coils, or Crimp Coil ends. Here we use these terms synonymously and interchangeably. Coil Ends are generally used with leather cords. and a hook, latch, lobster, or other clasp. Putting a coil end on a piece of leather requires a little practice, but it is not too hard. put a little glue on the end of the piece of leather (anything except super glue). Leather has natural oils and can be a bit oily. So it could may slip out of the coil end without the help of some glue. put the leather into the coil end. Twist the cord slightly as you push it all the way into the coil end. The ease of this step usually varies becuase cord widths & textures can vary. Place the coil end inbetween the jaws of an ordinary pair of flat-jawed pliers; using the broader end of the pliers (i.e. away from the tip of the pliers & nearer the joint of the plier). Crimp down the first part of the coil end (the end away from the coil-end-ring). Some people crimp down the first half of the coil end, others crimp down the 1st or first few coils (the end away from the coil-end ring)..
Do not crimp down so hard that you cut the leather. To test the secureness of the crimp, hold the coil with one hand and pull on the leather cord with the other. The cord should expand a little bit which indicates that the coil end is securely crimped. However if the leather starts to pull out, you need to crimp down again a bit harder. Do the same for the other end of the leather cord. Note that there is a ring at the end of each coil end. You may want to attach a clasp to one of these rings at one end of your coil-ended leather cord. At the other end of your cord, you can choose to leave the coil end as is so that you use the ring of the coil end itself, or attach a jump/split ring to the coil-end-ring at the other end. For 2mm cord, it's better to use the 1-2mm, rather than the 3-4mm cord end. If the cord is too large for the opening of the coil end, shave part of it down with a razor blade. If you have too thin a leather in comparision to the coil end you want to use, you can fold over the end of the leather cord before inserting it into the coil end.